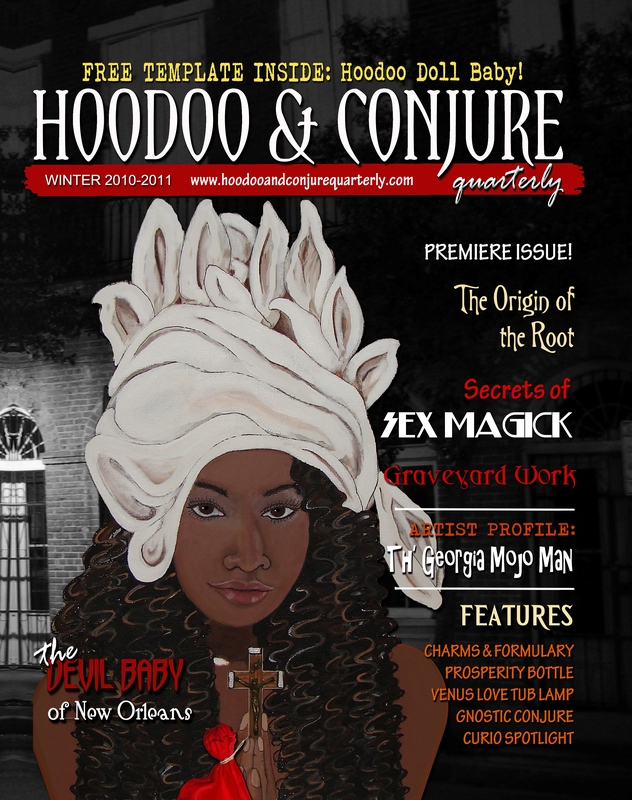 Hoodoo & Conjure Magazine is the first periodical to focus on New Orleans Voodoo and hoodoo and related Southern conjure traditions and folklore. The mission of Hoodoo and Conjure Magazine is to document New Orleans Voodoo, Hoodoo and conjure traditions in the 21st century, to advance the public understanding of said traditions, and to function as a resource for scholars and students exploring the religious, spiritual, and magical traditions with roots in the African Diaspora and Native American cultures. Hoodoo & Conjure Magazine shares historical and contemporary information about a variety of Southern magical and spiritual traditions with their roots in the African Diaspora and Native American cultures. Each issue of Hoodoo & Conjure Magazine brings you original and traditional formulas, spells, tutorials, conjure artist profiles, information about New Orleans Voodoo, Hoodoo, Louisiana folklore and more! Whether you are a beginner who is intrigued by the notion of Southern folk magic, an experienced rootworker who wants to pick up some techniques for your trick bag, a student or scholar who seeks information about the African-derived and indigenous spiritual traditions, or you want to keep up with the social world of today’s online practitioners, Hoodoo & Conjure Magazine delivers! The content of Hoodoo & Conjure Magazine comes from a variety of channels. There is an admixture of contributors that includes several notable authors, as well as “regular folks” from the hoodoo and conjure community. The intentional input of professionals and experienced lay people guarantees the reader receives a wonderful intersection – a crossroads, if you will – of authentic perspectives and practices. While the focus of HCM is to highlight the religious, spiritual and conjure traditions of my hometown New Orleans, it also explores various influences on these traditions. For example, we include articles about Solomonic mysticism and Catholicism because of the impact these traditions have had on New Orleans traditions as a result of historical factors, cultural adaptation and Creolization. Hoodoo & Conjure Magazine (formerly Hoodoo and Conjure Quarterly) is published by Creole Moon Publications, http://www.creolemoon.com. ‘I love your ‘knowledge’ and I in return have my own,I strongly believe In the power of ‘Voodoo’ and ‘Hoodoo’,anything I may learn shall only make me wiser. A friend showed me your site, wondering a bit about it. I started a website a while ago but am so busy just from word of mouth business that I’ve been afraid if it took off I’d be somewhat overwhelmed. Might be able to contribute an article here or there. Will check out your site further. I’m working with an author, jewell parker rhodes, and her latest book, HURRICANE which takes place in New Orleans. The book’s main character is based on the legendary Marie Laveau (or rather the character is Marie’s descendent). I wanted to know if you would be interested in featuring her and the book in your magazine. Sounds like this is the perfect fit! Sure, email me and we can talk details: voodoomama@planetvoodoo.com. Thanks! I am a print subscriber and moving. How do I change my mailing address with y’all? Please forward your change of address to hcq@planetvoodoo.com and I will make a note of it. Thanks!